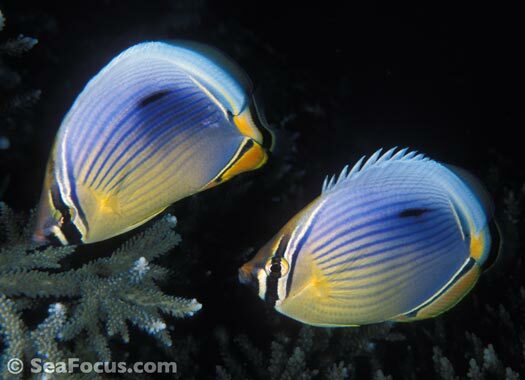 The butterflyfish family is a large group of around 120 species and 10 genera yet the exact numbers vary depending on which classification scheme you are looking at. 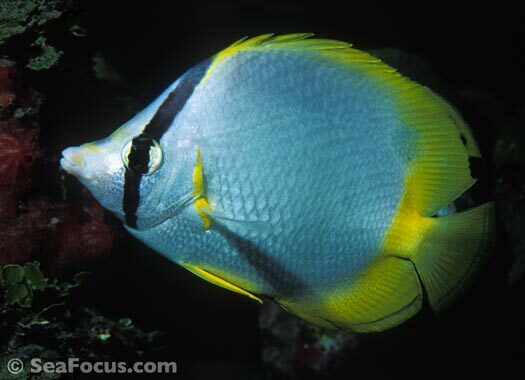 Nearly all butterfly fish are fairly small, generally up to 22 centimetres in length. 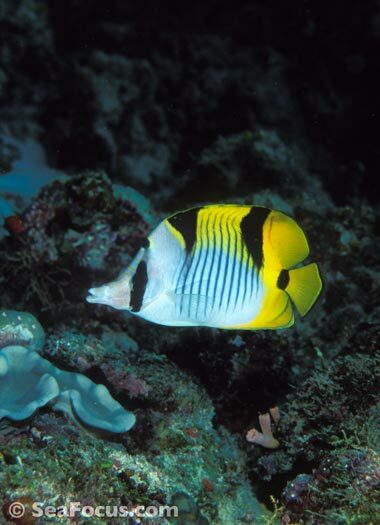 However, the lined butterflyfish grows to 30 cm.Their shape is always a deep-bodied disc, and thin from side to side, with a single dorsal fin. 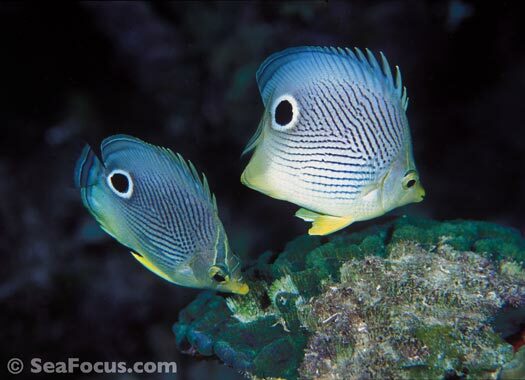 The family name derives from the Greek words for hair and tooth as they have rows of brush-like teeth found in their tiny protruding mouths. 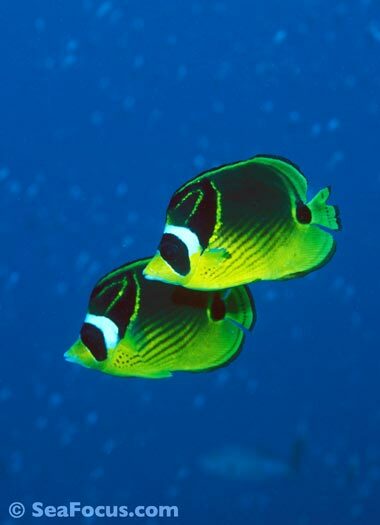 Most adult butterflyfish live as heterosexual couples that swim in tandem around a private patch of reef they have staked a claim over. 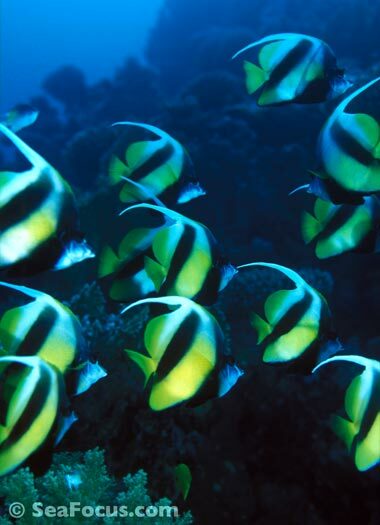 The majority are coral eaters and stay on coral reefs but a few types form large groups that hang around together in swarms. 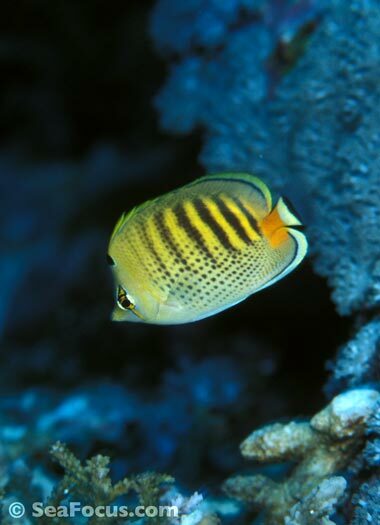 At dusk they find shelter in a reef recess and become inactive. As they settle in for the night, daytime colours pale and markings change. 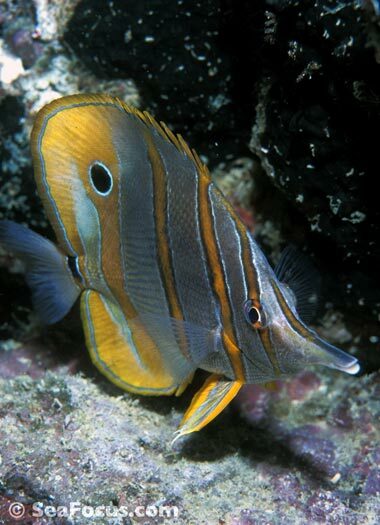 Like real butterflies, the fishy versions display impressive body decoration: masks, false eyespots, stripes, bands and checks in a myriad of colours. 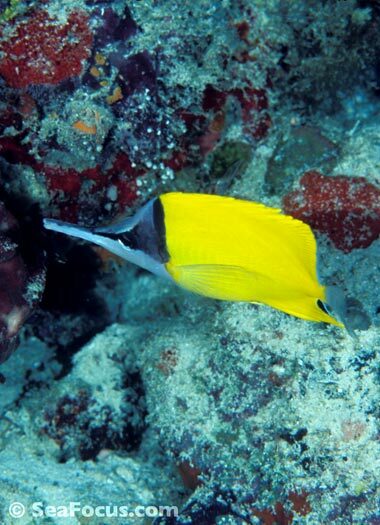 Many butterflyfish are confused with angelfish, and there are similarities, but angels can be spotted by noting the sharp spine that sits across the lower edge of their gills. 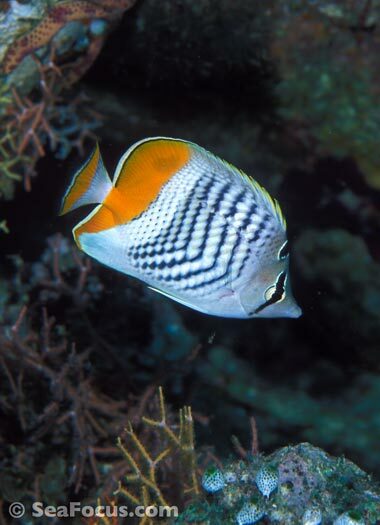 Another case of mistaken identity is the Moorish Idol, which is neither a buuterflyfish nor an angel, but the sole representative of the family Zanclidae. 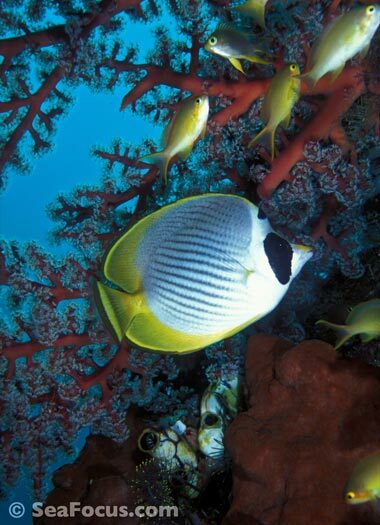 Butterflyfish are not regarding as threatened, but their habitas are at risk. 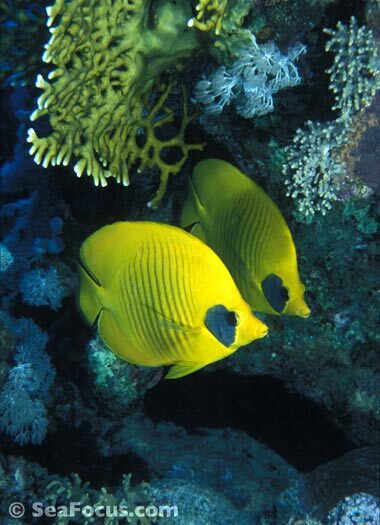 Swimming along the shallow, sloping reef rim that extends from Mnemba island, there are many tiny reef ledges full of tropical fish including various butterflyfish. 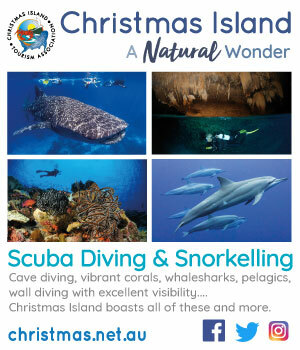 Eventually the slope levels out at drop the sandy bottom where we found a small cavern full of glassfish, that were being watche dby hungry leaffish and scorpionfish. 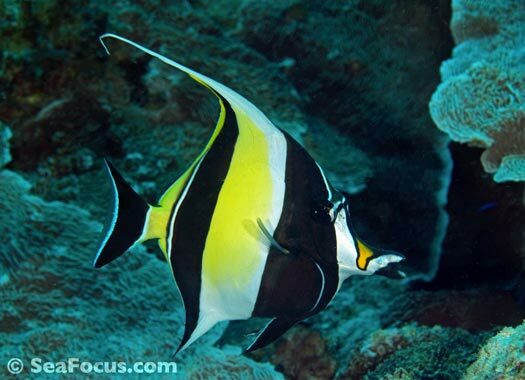 This Moorish Idol was patrolling along the outside. 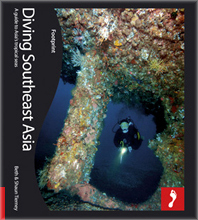 He was alone but we found others a little deeper. 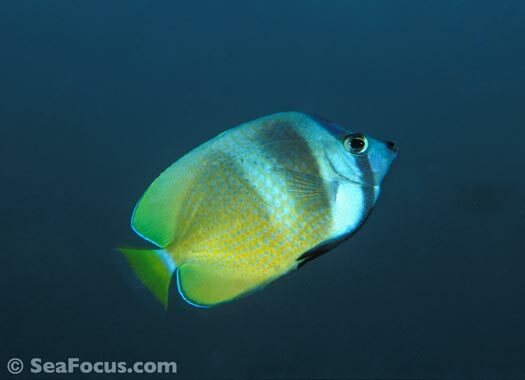 These fish are often called butterflyfish as they look very similar to juvenile bannerfish (see image 8 in the gallery above). 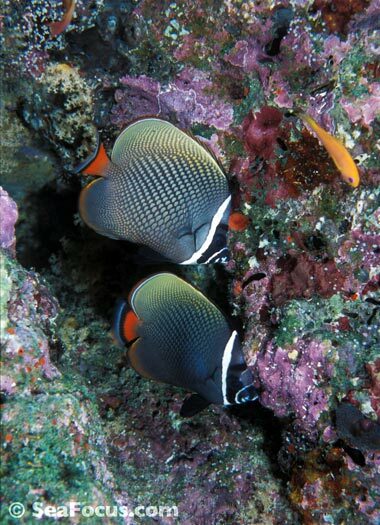 REFERENCE | The best tropical fish identification book is Reef Fish Identification – Tropical Pacific.